Martha A. Mirmak, age 88 years, of Raritan Township, NJ, died Tuesday, April 2, 2019, at the All American Assisted Living Center in Hillsborough, NJ. Born July 25, 1930, in Ashley, PA, she was the daughter of the late John Breznay and Martha Gdovin-Breznay. 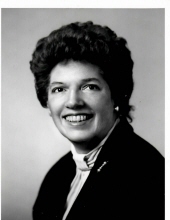 She was a graduate of Hanover Township, PA High School and Wyoming Seminary Dean School of Business, Kingston, PA. Martha was last employed as a secretary by the Parker Agency in Flemington, NJ, retiring in 1993. She previously lived in Newark, NJ, Williamsport, PA, Kingston, PA, and Forty Fort, PA before moving to Flemington, NJ in 1972. She was a communicant of St. Magdalen Roman Catholic Church, Flemington, NJ. Her husband, John B. Mirmak died in 2001; her first husband, John A. Kendra died in 1969. She is survived by two sons, David J. Kendra of Flemington, NJ and Andrew J. Kendra of Bedford, MA and a daughter, Diane J. Sersen of W. Melbourne FL; three grandchildren and two great-grandchildren. A Mass of Christian Burial will be celebrated by Rev. Walter Wiktorek on Tuesday, April 9, 2019 at 10:30 AM in St. Magdalen Church, 105 Mine Street, Flemington, NJ under the direction of the Holcombe-Fisher Funeral Home, 147 Main Street, Flemington, NJ. Entombment will follow in St. Magdalen Mausoleum, North Main Street, Flemington, NJ. Calling hours will be held Tuesday, April 9, 2019 from 9:00-10:00 AM in the Holcombe-Fisher Funeral Home. Memorial contributions in Martha’s name may be made to the Alzheimer’s Foundation of America, 322 Eighth Avenue, 7th floor, New York, NY 10001. "Email Address" would like to share the life celebration of Martha A. Mirmak. Click on the "link" to go to share a favorite memory or leave a condolence message for the family.